Bhote Kosi River Rafting implies that this river has its origin in Bhot or Tibet. It has upper sections of grade 5 and 6. Most of the the commercially rafted section is from much lower down and has an overall grade of 4 with a couple or so harder rapids that warrant a 4+ or 5-. Drawing its amazing power from high up in Tibet, the river tumbles into Nepal through breathtaking gorges. 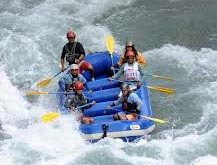 With a series of technical rapids in this river that require full attention and commitment by everyone. Rafting begins with 4 hrs drive from Kathmandu and returning time by drive takes 3 hrs only. Drive from Kathmandu to put-in point , camp prepared, lunch served and run upper section of river, back to camp for the evening. Upper sections run again then downstream to take-out, bus back to Kathmandu arriving pm of the day. Inflatable boat, helmet, paddle, lifejacket, rescue rope, carabena, water, hygienic full meals during river time, free rum and coke, transport by bus, kitchen wear, excellent cook, expert guide, rescue Kayak, sleeping tent and mattress. Your insurance, personal belongings, sleeping bag, sun glass with rope, personal snack or water during bus ride, sandle and sun cream.